Robotics has experienced a big resurgence in the last decade. This has been fueled by the success of unmanned vehicles and by research advances such as those demonstrated by self-driving cars. Though many amazing robotic feats have been demonstrated, many challenges remain. We competed and placed second in the DARPA Robotics Challenge, which was an international competition aimed at advancing ground robotic capabilities focused on disaster response. IHMC used the Boston Dynamics designed Atlas robot for the competition. We continue to do research using the Atlas robot, but our primary focus is now a NASA project for co-exploration using humanoid robots as avatars. This project uses NASA Johnson Space Center’s Valkyrie humanoid robot. Both of these projects involve humans remotely operating humanoid robots in natural and man-made environments to accomplish useful work. A big challenge for humanoid robots is bipedal walking. 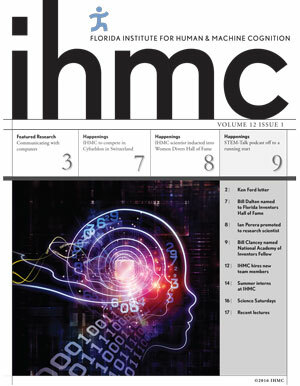 IHMC has been pioneering advanced control techniques for bipedal robots to maintain balance while walking over a wide variety of terrains. While great strides have recently been made in robotics, robots still are unable to get to all the same places as people. Our humanoid projects are focused on pushing our bipedal humanoids capabilities forward to handle rough terrain without any knowledge of the environment from onboard sensors. Then, when this knowledge is included, their performance is further improved. We are also focusing on the ability to robustly handle external disturbances. Our goal is to tackle increasingly more difficult walking challenges, giving robots the ability to traverse environments they never have before. In addition to pushing forward in areas like balance and mobility, we have also been seeking to drive forward advancements in the speed and agility of legged robots. We take inspiration from the study of how legged animals move and try to analyze what makes them stable and graceful. We have translated this study into two fast-running, biologically-inspired legged robots; the FastRunner and the HexRunner. These machines employ designs that eliminate the need for complex balancing algorithms by incorporating stability and robustness in to their form and structure, even during dynamic activities like running. Part of effectively developing humanoids as avatars involves developing the system to effectively work with the human operator. This involves understanding the design requirements for both the operator interface and the underlying algorithms. Our approach to this is called Coactive Design. This approach has led to the development of a very effective human avatar interface. We also apply this design approach to our unmanned aerial vehicle (UAV) project. The approach enables the human to assist the UAV in navigating complex environments and avoiding obstacles. Our research in wearable robotics has developed several variations of lower body exoskeleton devices. These devices encompass a vast array of applications including mobility assistance for spinal paraplegic injuries, strength amplification for able-bodied users, and compact resistance exercise for astronauts in space. By collaborating with other leaders in the field such as NASA Johnson Space Center, we hope to advance the state of the art in wearable robotics to be compact, light-weight, safe, and an avenue for increasing the quality of life and performance across a wide variety of challenging and critical situations. Additionally, we are interest in community outreach and helping the public better understand the abilities and limitations of robotics. One of the goals at IHMC is to engage in public outreach to instill this understanding and an interest in the work that we do. We attempt to do this by introducing robots to people’s lives and inspiring the children that will become future roboticists to pursue paths that will help make sure that there is no shortage of talented scientists, researchers, and engineers ready to help develop the next great robot.